As 2014 draws to a close the Fed is presented with a problem. Based on recent speeches, a substantial part of the committee seems eager to raise rates. At the same time. some of the Fed’s preferred metrics suggest this may be premature and the market is trapped in between. Market participants are on the lookout for clarity in next week’s press conference from Chair Janet Yellen. The expectation among Fed watchers is that at next week Yellen will solidify expectations that rates will begin to rise in June 2015. Why do I think the Fed is getting ready to raise rates? We discussed the shifting composition of the voters on the committee a few weeks ago and came to the conclusion that the shift involved roughly equal numbers of hawks and doves coming and going. When we look at the statements from the permanent members such as Vice Chair Stanley Fischer (see this WSJ interview) and NY Fed President Dudley, I see a more hawkish tone. Why this shift? 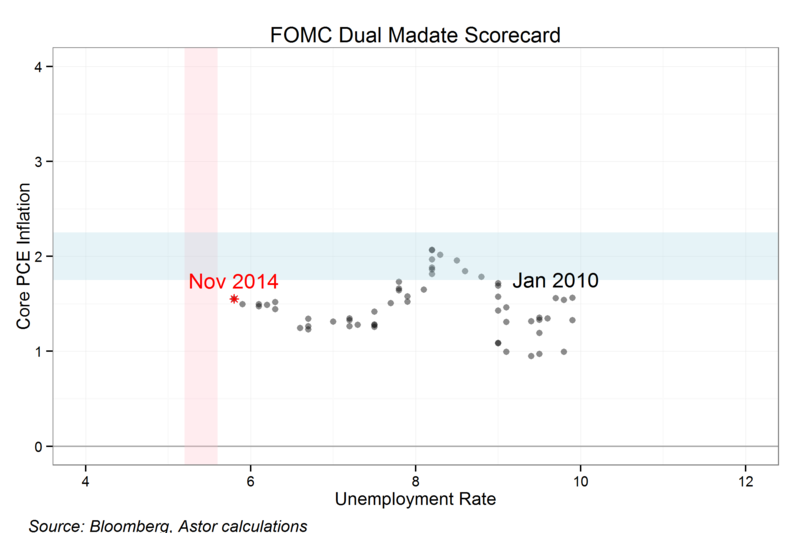 Below I graph the Fed’s performance against its dual mandates of stable prices and full employment. The chart shows unemployment and inflation along with the Fed’s inflation target (in blue) and the unemployment rate consistent with stable prices (in pink). The economy has improved without inflation over the last five years. Today, the Fed is in the happy spot where there is slack in both inflation and unemployment. What does the market think about the Fed’s likelihood of raising rates? 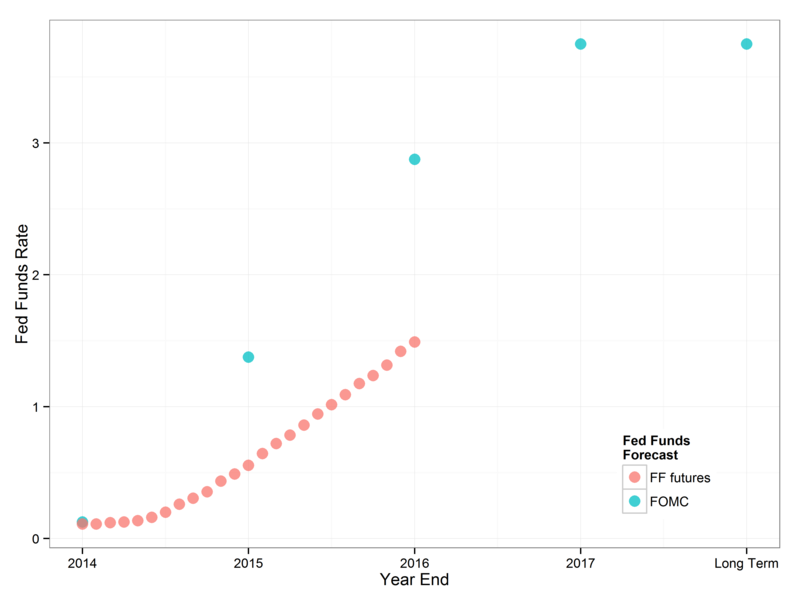 We can plot the fed funds futures against the Fed’s forecast of where rates will be at year end as revealed in their quarterly reports. This chart shows that as of yearend 2015 the FOMC expects short term rates to be around 1.375% (up from about 0.125%) and the fed fund futures market expects the same rate to average around 0.55% that month. We see similar skepticism in the low level of yields in US treasures. One interpretation of US ten year bonds yielding 2.16% is that the Fed’s expectations of rates (the blue dots) are either will not materialize or will need to be quickly reversed. That is, if the bond market believe that short term rates were going to 3.75% by 2017 and staying there, the ten year bond would yield a lot closer to 3.75%. In fact the Fed’s survey of major market participants reveals a 20-30% possibility that the Fed will be led to quickly undo its rate rise. It would not be the only central bank to reverse course since the crisis. How might the Fed square the circle? 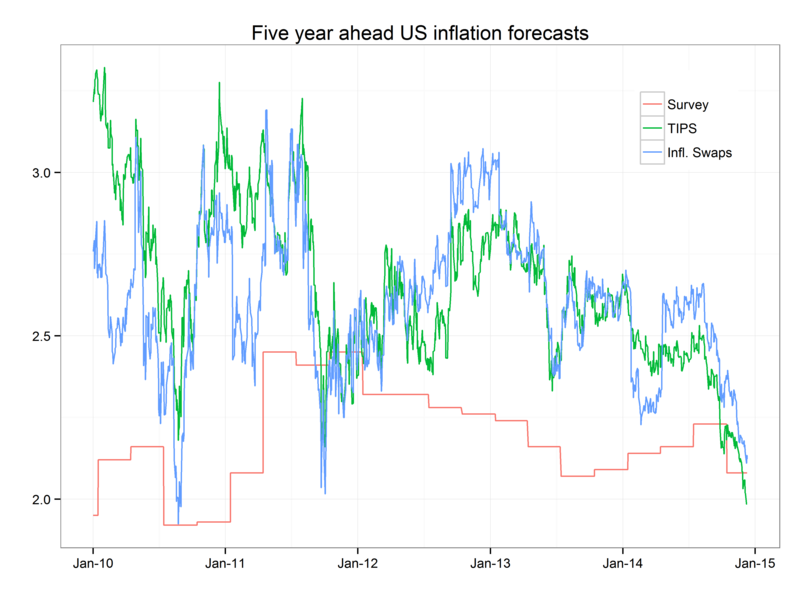 If inflation expectations remain low it is hard to see the forecast of rates represented by the blue dots coming to pass. On the surface, this is very odd. The fed gets to set the level of short term interest rates, its forecasts of fed funds should be as accurate as my forecasts of my daughter’s allowance: completely with the control of the forecaster. Perhaps the forecast should be seen a way as allowing hawkish members to blow off steam. If so, it would be better to discontinue them. I am currently expecting 1) the Fed will raise short term interest rates beginning in June 2) they will only raise rates slightly over the course of the year and fed funds will end the year below 1%. It will remain to be seen if the Fed will walk back the higher expectations found in their quarterly forecasts. My guess is that hints of more aggressive moves will cause some substantial moves in the fixed income markets.